Marine enthusiasts from an international school in Dubai go snorkelling in Borneo! 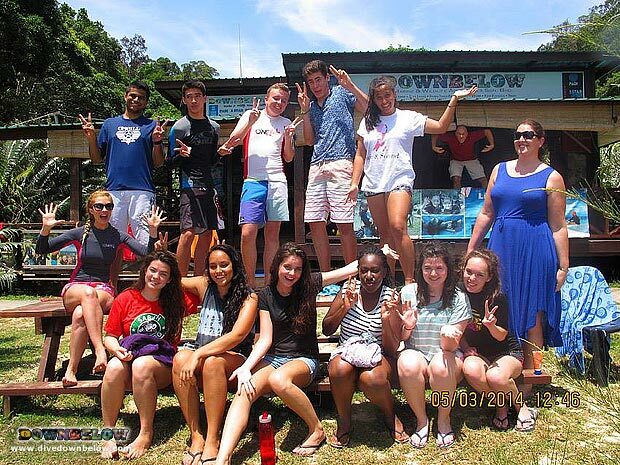 Home/News/Marine enthusiasts from an international school in Dubai go snorkelling in Borneo! Our friends from Wild Borneo Expedition brought along a friendly group of international students from Dubai to enjoy tropical coral reefs of Tunku Abdul Rahman Park in Borneo! The marine enthusiasts’ enjoyed a day of snorkelling with some of our experienced PADI Instructors to supervise them throughout each session. To begin the day, a few skills are demonstrated for comfort whilst snorkelling, and then all will board one of our fast speedboats to our most beautiful snorkelling sites in the protected marine park. At one such snorkelling site, the lucky international students spotted blacktip reef sharks cruising in the shallow waters hunting for easy prey. But the snorkelers weren’t afraid a bit, as our snorkel guides explained in the briefing that these sharks are actually very shy. For a fun-filled day at our Gaya Island beach house, and under the direct supervision of our experienced professional island team, contact one of our Head Office staff in KK Times Square to prepare a thorough itinerary to accommodate a large group of nature lovers to have the Borneo adventure of a lifetime! By Joanne Swann|2014-03-11T16:51:00+08:00March 11th, 2014|News|Comments Off on Marine enthusiasts from an international school in Dubai go snorkelling in Borneo!